It’s not easy to reintroduce a classic. The re-design has to live up to the best of the previous boat’s advantages, but also must demonstrate that modern technological advances have made it even better. Nearly 20 years after the launch of the First 25, Beneteau has taken the best of both the old and new and introduced the First 25 S: in the process creating a boat that is slippery, easily sailed, won’t break the bank and includes a lot to like within the confines of its modest LOA. First and foremost, the new boat lost almost 1,000 pounds from the original—thanks to its resin transfer molded construction—even as the transom gained some girth. To accommodate the latter, the boat’s designers installed twin kick-up rudders to keep her tracking regardless of angle of heel. Like most modern Beneteaus, the bow is nearly plumb with a deep V-entry forward, rounded midsections and a flatter underbody aft. The result is a boat with a long sailing waterline, the necessary form stability to stand up to a press of sail, and plenty of control in the event the wind puts the boat on its ear. Two keel configurations are available. 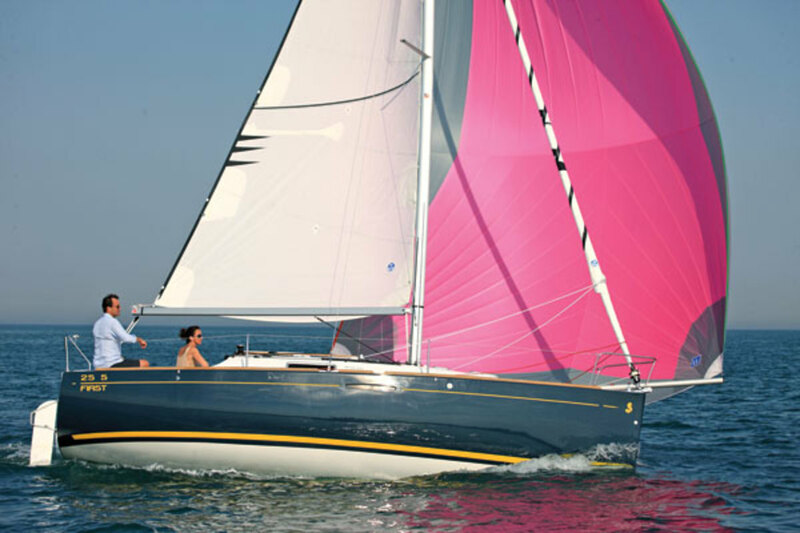 The standard fixed keel draws 4ft 9in, while the optional swing keel deploys to 6ft 1in. It also snugs up to where it draws just under 3ft—a draft that can be reduced no further because of the boat’s shaft and prop. The extra $1,200 for the retractable (hand-cranked) keel will be worthwhile if you sail in skinny waters or plan to trailer the boat to new cruising grounds. The cockpit is large enough for four adults, while still leaving plenty of room for the tiller to move freely. The main traveler is mounted across the transom, and most of the work is done by two Harken winches mounted at the companionway that serve both as primaries and halyard winches. The boat’s electronics package includes a set of Raymarine instruments. The headsail is set on a Facnor furler. 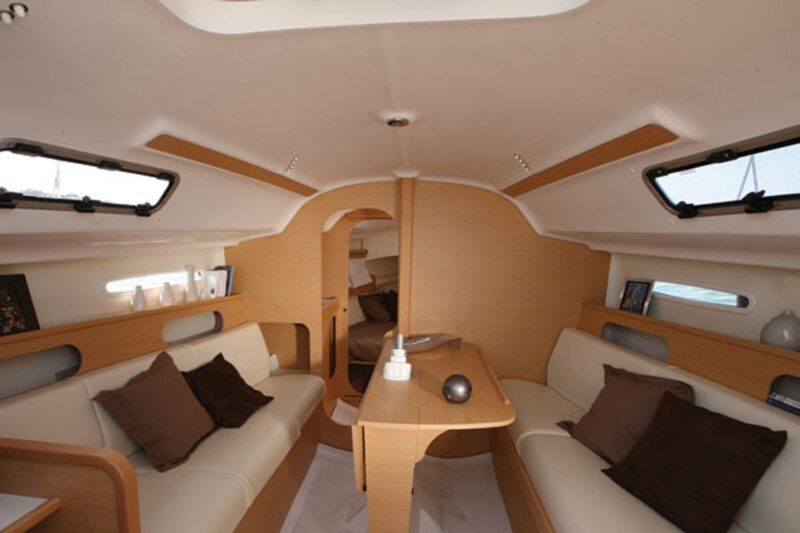 Belowdecks, the Beneteau 25 S is a lot more than just a daysailer. To port of the companionway is a compact galley, with a sink and manual water pump, an icebox and an optional one-burner gimbaled stove. Forward in the saloon, twin settees are separated by a drop-leaf table. Forward of that, immediately aft of the V-berth is a pass-through area containing a sink and enclosed head. An especially surprising touch is the dedicated aft-facing nav desk to starboard of the companionway that uses the starboard settee as a seat. The headroom at the companionway is 5ft 10in and tapers down to 5ft 1in in the forward stateroom. All in all, there’s plenty of room aboard this “daysailer” for comfortable weekend cruising. Unfortunately—or maybe, fortunately, given that light airs are what often show off a boat’s true sailing ability—our test on the calm waters of the Chesapeake left us with a variable breeze of 7 knots or less. However, while other boats stood virtually still around us, we slipped along at 4.7 knots at a 60-degree apparent wind angle. When we fell off to a broad reach, we still carried 4.2 knots—plenty of get up and go for effectively gybing downwind in a drifter. For those interested in even more speed off the wind, the boat can be rigged with a retractable sprit and A-sail that will provide speed to burn, especially in the puffs. The rig has single, aft-swept spreaders and a 9/10th aluminum deck-stepped mast that rises 41 feet above the waterline. The large flat-top North Sails main drove the hull well to windward, even when sailing as close as 40 degrees off the wind. The Beneteau First 25 S is powered by a 14hp Yanmar diesel with a standard fixed prop that will push the boat near 7 knots on flat water. Fuel tankage is a bit limited, with only 8 gallons capacity, but because the boat is light enough to sail when others motor, this should be sufficient for all but extended cruises. Beneteau’s marketing material describes the boat as being built for “spontaneous day-cruising,” but it’s clear there is enough performance in this design for the boat to get in some fun and exciting club racing as well. Equally appealing is the idea that you can trailer the First 25 S pretty much anywhere, launch it and go exploring to your heart’s content. In short, this is one nice little boat.